MP4 and WMV are two popular video formats that can be applied to most media players, portable devices, and network platforms. However, many users cannot tell the differences clearly when it comes to MP4 vs WMV. Which video format should you choose, MP4 or WMV? In this article, we will give you a detailed comparison between the two formats. What is MP4: MP4 is short for MPEG-4 Part 14. It is a container format most commonly used to store videos and audios. Also, it can be used to store subtitles, images, etc. Like most container formats, it allows multimedia streaming over the internet. MP4 is the official filename extension for MP4 files; it is the most common format for smart phones, tablets, media players, and thousands of other devices. Other extensions include .m4a, .m4p, and .m4a. What is WMV: WMV is short for Windows Media Video. It is a video compression format developed by Microsoft for several proprietary codecs. Its main competitors are MPEG-4 AVC, AVS, RealVideo, and MPEG-4 ASP. WMV was originally designed for internet streaming applications. Through standardization by the Society of Motion Picture and Television Engineers (SMPTE), WMV 9 has gained adoption for physical-delivery formats such as HD DVD and Blu-ray Disc. MP4 vs WMV – What Are Their Differences? Needs plug-ins like Flip4Mac when playing WMV files on Mac; Video transmission has a delay. MP4 vs WMV – What Are Their Similarities? Although MP4 and WMV are different containers, they still have something in common: the two video formats can still maintain the best possible quality. That's why both are regarded as the most commonly used container formats. 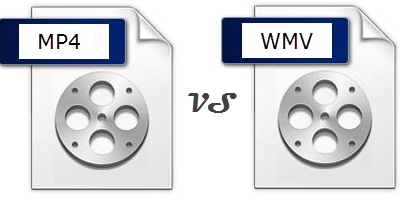 Both MP4 and WMV have rather good compression ability to help users save disk space. What's more, both can work well with their corresponding platforms. Summary: Through the comparison between MP4 and WMV, we can see that one does not clearly look better than the other. In general, MP4 is highly recommended over WMV. It is compatible with thousands of media players and portable devices, and has better portability if you intend to move it from Windows to another OS like Mac, Linux, or even UNIX, which will never be achieved by WMV. However, for Windows PC, Windows tablets and Lumia users, WMV is still a good video format that saves high quality video with smaller file size. So if the question "mp4 or wmv" occurs once again, you really needs no more hesitation, because both are definitely the best on your priority list. All depends on your own situation. Both WMV and MP4 are served for specific needs. One may be playable on PC while the other, may run into error when it comes to the inproper codec, resolution bit rate and more. To play the two formats freely on any devices, MacX Video Converter Pro can easily convert MP4 to WMV or WMV to MP4, or other formats. 1. With 320+ video codecs and 50+ audio codecs, this HD video converter is able to convert WMV to MP4 or MP4 to WMV, H265, AVI, MOV, MPEG4, H264, MKV, etc. 2. With 420+ presets for latest mobiles, it will transcode MP4/WMV,other videos to iPhoneX/8/7/6, iPad Air 2, iPad, Samsung Galaxy S9, FCPX, iMovie, Youtube, etc. 3. With unique support for Intel QSV, Nvidia Cuda/Nvenc, AMD hardware acceleration tech, it can convert WMV/MP4 videos with 5X faster speed. After download and install the software, run it. Then click "Add File" to load the WMV or MP4 video files (or others). Select the format from the profiles bar at the bottom of the interface. You will find all the formats you need in the list like MOV, AVI, HEVC, MKV, FLV, 3GP, others. Besides, to upload your video to web, select YouTube, FaceBook or others, to play the videos on mobiles, select iPhone, iPad, Samsung, PSP, Huawei, others, it will directly convert the WMV/MP4 videos into perfect formats, quality and sizes for the platforms. As optional features, the Toolbox in the Target Format bar will further edit the videos if necessary. 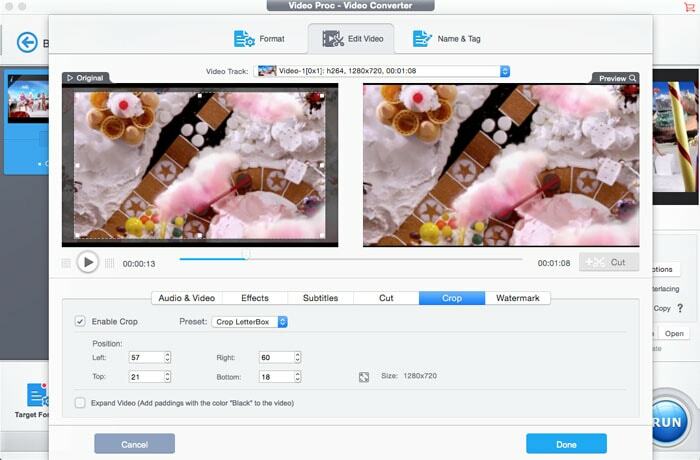 You can cut, trim, split, rotate, compress, deshake, denonise, add watermaks/subtitls etc. You can also adjust the click the gear button behind the video info on the interface to adjust the bit rate, resolutions, quality, frame rate, GOP and other parameters. Now click Run to convert the WMV and MP4 videos. Don't forget the check the box of hardware accelerate engine on the interface. Play WMV on Mac ｜How to Open WMV Files and Watch WMV Movies on Mac OS? To play WMV files on Mac, you can convert WMV to MP4 MOV, or use WMV player to play WMV on Mac. Which one is better? Read on and choose the ultimate way to open WMV on Mac OS X.
MacX Video Converter Pro is an all-in-one video converting program with top quality and fast speed. With the aid of this feature-rich video converter, everyone can easily convert HD or SD videos to mobile devices.